eIMACS is pleased to announce that the 18th and final course of the Elements of Mathematics: Foundations (EMF) series, Precalculus Coda, is now available online at www.EMFmath.com. Precalculus Coda brings together topics from earlier courses and expands on them with an extensive study of vectors in the real number plane and space, linear transformations (including orthogonal mappings), and matrices and their application in solving systems of equations. Course 1 < $20: Enroll in the first EMF course (Operational Systems) at a 67% discount. To enroll in Operational Systems for US$19.95 (regularly US$59.95), visit www.EMFmath.com, click on the Course 1 promotion link, and complete the enrollment process on or before August 31, 2018. EMF Course Pack 18: EMF Course Pack 18, which includes all 18 EMF courses, is available at a 25% discount. To enroll in EMF Course Pack 18 for US$809.95 (regularly US$1,079.10 when purchased separately), visit www.EMFmath.com, click on the EMF Course Pack 18 promotion link, and complete the enrollment process on or before August 31, 2018. Pre-Algebra Plus: Pre-Algebra Plus, an online pre-algebra course within the EMF program, is available at a 33% discount. Learn more about the course. To enroll in Pre-Algebra Plus for US$360 with an enrollment period of 300 days, visit www.EMFmath.com, click on the Pre-Algebra Plus promotion link, and complete the enrollment process. Visit www.EMFmath.com to enroll today! eIMACS is pleased to announce that the seventeenth course of the Elements of Mathematics: Foundations (EMF) series, Geometry: Coordinates and Measurement, is now available online at www.EMFmath.com. Geometry: Coordinates and Measurement concludes the study of Euclidean geometry in EMF, with a focus on measurement in two and three dimensions: of area, volume, distance, taxi-distance, conic sections; introduces vector spaces; and reexamines isometries in the context of coordinate systems. Try the First Course: Try the first EMF course (Operational Systems) at a 25% discount. To enroll in Operational Systems for US$44.95 (regularly US$59.95), visit www.EMFmath.com, click on the first course promotion link, and complete the enrollment process on or before April 9, 2018. EMF Course Pack 17: EMF Course Pack 17, which includes the first seventeen EMF courses, is available at a 25% discount. To enroll in EMF Course Pack 17 for US$765.95 (regularly US$1,019.15 when purchased separately), visit www.EMFmath.com, click on the EMF Course Pack 17 promotion link, and complete the enrollment process on or before April 9, 2018.
eIMACS is pleased to announce that the sixteenth course of the Elements of Mathematics: Foundations (EMF) series, Geometry: Congruence and Similarity, is now available online at www.EMFmath.com. Geometry: Congruence and Similarity continues the study of Euclidean geometry in EMF. Students begin by investigating congruent figures in order to extend their knowledge of reflections, translations, rotations, and glide-reflections, together known as isometries. They then prove that these "rigid motion" mappings form a group. Equipped with their understanding of group properties from EMF's abstract algebra courses, students spend the first part of this course exploring congruence and symmetry, including properties of congruent triangles and a classification of polygons in terms of their symmetry groups. The second part of the course focuses on magnifications and their properties. Students explore what happens when magnifications are composed with themselves and with isometries and discover that these compositions, known as similitudes, also form a group. The third part of the course provides an in-depth study of circle geometry incorporating multiple applications from the first two parts. Because EMF teaches mathematics as a unified body of knowledge rather than a collection of unrelated topics, students come to realize a fundamental connection between algebra and geometry that most traditional school math students will never know. Try the First Course: Try the first EMF course (Operational Systems) at a 25% discount. To enroll in Operational Systems for US$44.95 (regularly US$59.95), visit www.EMFmath.com, click on the first course promotion link, and complete the enrollment process on or before February 8, 2018. EMF Course Pack 16: EMF Course Pack 16, which includes the first sixteen EMF courses, is available at a 25% discount. To enroll in EMF Course Pack 16 for US$719.95 (regularly US$959.20 when purchased separately), visit www.EMFmath.com, click on the EMF Course Pack 16 promotion link, and complete the enrollment process on or before February 8, 2018.
eIMACS is pleased to announce that the fifteenth course of the Elements of Mathematics: Foundations (EMF) series, Geometry: Incidence and Transformations, is now available online at www.EMFmath.com. Geometry: Incidence and Transformations begins the formal study of Euclidean geometry in EMF. Working in the three-dimensional context of space, the two-dimensional context of planes, and the one-dimensional context of lines, students investigate familiar geometrical figures and a variety of ways of transforming them. In the first half of the course, real-world experiences with physical objects are used to inform the mathematically rigorous construction of analogous geometric objects and the properties they should have. The second half of the course builds on concepts from Sets and Mappings in order to explore transformations — reflections, translations, rotations, and magnifications — as mappings on sets of points. Students prove numerous results that are typically taken as given in high school geometry as they ascertain which of these transformations are permutations and which permutations preserve betweenness, collinearity, angle measure, distance, and circular orientation. As this is EMF, the proofs that students complete go well beyond the basic two-column high school proof in complexity, sophistication, and consequence. Try the First Course: Try the first EMF course (Operational Systems) at a 25% discount. To enroll in Operational Systems for US$44.95 (regularly US$59.95), visit www.EMFmath.com, click on the first course promotion link, and complete the enrollment process on or before October 31, 2017. EMF Course Pack 15: EMF Course Pack 15, which includes the first fifteen EMF courses, is available at a 25% discount. To enroll in EMF Course Pack 15 for US$674.95 (regularly US$899.25 when purchased separately), visit www.EMFmath.com, click on the EMF Course Pack 15 promotion link, and complete the enrollment process on or before October 31, 2017.
eIMACS is pleased to announce that the fourteenth course of the Elements of Mathematics: Foundations (EMF) series, Real Functions II, is now available online at www.elementsofmathematics.com. Real Functions II begins with an introduction to sequences and series, including in-depth coverage of arithmetic and geometric sequences and series. Students continue to expand their knowledge of real polynomial functions such as integer and rational power functions, exponential and logarithmic functions, the absolute value function, rational functions, and asymptotes. The course builds on material from Sets, Mappings, and Probability I to explore the Binomial Theorem, a fundamental result with uses as varied as the distribution of IP addresses and financial modeling. Practical applications, including two extensive case studies in statistics, continue to demonstrate algebra's usefulness in the real world. The course culminates with an introduction to the field of complex numbers as a field extension of the real field and to polynomial functions over the complex field. Throughout, EMF students will prove many of the results about real and complex functions that typical high school students are only asked to memorize and apply. With respect to developing students' proof-writing skills, Real Functions II marks the completion of the transition from outline proofs to paragraph proofs. Operational Systems: Try the first EMF course (Operational Systems) at a 25% discount. To enroll in Operational Systems for US$44.95 (regularly US$59.95), visit www.elementsofmathematics.com, click on the Operational Systems promotion link, and complete the enrollment process on or before December 3, 2016. EMF Course Pack 14: EMF Course Pack 14, which includes the first fourteen EMF courses, is available at a 25% discount. To enroll in EMF Course Pack 14 for US$629.95 (regularly US$839.30 when purchased separately), visit www.elementsofmathematics.com, click on the EMF Course Pack 14 promotion link, and complete the enrollment process on or before December 3, 2016. Visit www.elementsofmathematics.com to enroll today! IMACS is pleased to announce that the thirteenth course of the Elements of Mathematics: Foundations (EMF) series, Real Functions I, is now available online at www.elementsofmathematics.com. Real Functions I introduces the real number system as an extension of the ordered field of rational numbers and goes on to investigate certain fundamental classes of functions on the real numbers. Students learn to analyze systems of first and second degree equations and inequalities using graphical and computational methods. The course culminates with an in-depth derivation of the quadratic formula — typical high school algebra students are merely asked to memorize this formula — after which EMF students will be well-versed in methods for solving first and second degree equations and inequalities, as well as understanding why these methods work. Try the First Course: Try the first EMF course (Operational Systems) at a 25% discount. To enroll in Operational Systems for US$44.95 (regularly US$59.95), visit www.elementsofmathematics.com, click on the Operational Systems promotion link, and complete the enrollment process on or before July 10, 2016. EMF Course Pack 13: EMF Course Pack 13, which includes the first thirteen EMF courses, is available at a 25% discount. To enroll in EMF Course Pack 13 for US$584.95 (regularly US$779.35 when purchased separately), visit www.elementsofmathematics.com, click on the EMF Course Pack 13 promotion link, and complete the enrollment process on or before July 10, 2016. Ladies Learning Code and the Institute for Mathematics and Computer Science (IMACS) are partnering to award over $3,000 in scholarships to participants in the 2016 Girls Learning Code Camps and members of GLC's Teen:Club. The two full and three half scholarships will allow recipients to enroll in IMACS' introductory computer science course, University Computer Science I (UCS1). 240 girls ages nine to twelve are expected to attend Girls Learning Code Camps in Toronto this March and Summer. The camps are designed to help girls see technology in a whole new light — as a medium for self-expression, and as a means for changing the world. IMACS will award one full scholarship and one half scholarship among applicants who attend the camps. All campers are invited to apply. Shuli Jones attended the very first Girls Learning Code camp as a 6th grader back in 2012 where she won a half scholarship to UCS1. She is now a sophomore in high school and recently scored a '5' on the AP Computer Science A exam as a freshman. Since starting IMACS' computer science courses soon after the camp, Shuli has been one of IMACS' top CS students. IMACS will award the other full scholarship and two half scholarships to members of GLC's Teen:Club. In Teen:Club, 13 to 17 year old girls focus on solving problems, turning ideas into reality and learning about what a future in technology could look like. All members are invited to apply. "Now that we have been running youth programs for 4 years, we are really starting to see our participants move on to technical career paths, pursuing Computer Science in University and coming back to participate in our programs as mentors, inspiring the next generation of girls," says Laura Plant of Ladies Learning Code. "We're excited for our girls to have an opportunity to study computer science at a high level with IMACS." "IMACS believes in the potential of bright girls and young women to shape a better future for all people," adds IMACS president Terry Kaufman. "We are thrilled to be working with Ladies Learning Code again to encourage more girls to pursue computer science in college and in their careers." The course, UCS1, is a challenging and engaging introductory programming course that gives students the tools they need to excel as a computer science major in college. UCS1 teaches the fundamental principles of computer science at the university level but was developed for talented middle and high school students. Scholarship applicants must submit a 100-250 word essay to Ladies Learning Code on what they hope to get out of this program. They are also required to pass the online eIMACS Aptitude Test. The application deadline for these scholarships is August 31st 2016. Applicants may register for the eIMACS Aptitude Test at www.eimacs.com/aptitude. On the online registration form, enter "Girls Learning Code 2016" in the box for "How did you hear about IMACS?" Ladies Learning Code is a Canada-wide not-for-profit organization that runs workshops for women and youth who want to learn beginner-friendly computer programming and other technical skills in a social and collaborative way. Today they have 22 chapters (and counting) across Canada, a thriving girls' program called Girls Learning Code and co-ed kids program called Kids Learning Code. With sponsors and community partners that include TELUS, Microsoft, Facebook, Autodesk, Google and many more, Ladies Learning Code has become synonymous with technology education in Canada. 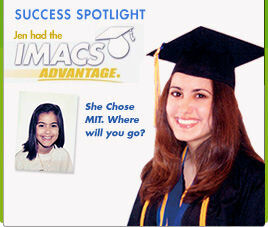 Founded in 1993 by a team of mathematicians, computer scientists and educators, IMACS offers talented middle and high school students a range of online courses in university-level mathematics and computer science that are recognized by many prestigious universities. IMACS also offers math and computer enrichment classes at its US centers in Florida, North Carolina, Missouri, Connecticut and California. Over 4,500 students throughout the US and the world attend local IMACS classes or study its online courses. For more information on IMACS visit www.imacs.org. IMACS is pleased to announce that the twelfth course of the Elements of Mathematics: Foundations (EMF) series, Algebra: Relational and Ordered Operational Systems, is now available online at www.elementsofmathematics.com. Algebra: Relational and Ordered Operational Systems completes the study of abstract algebra in EMF. Students learn how groups, rings and fields can be combined with certain kinds of relations to form new structures, specifically relational systems and ordered systems. Within such systems, techniques for solving inequalities are given a much more in-depth treatment than has been possible in earlier courses. Students who complete the EMF algebra series will be able to solve any high school algebra problem with ease. But they will also have learned a great deal more and be well-prepared to study high-level mathematics. Operational Systems: Try the first EMF course (Operational Systems) at a 25% discount. To enroll in Operational Systems for US$44.95 (regularly US$59.95), visit www.elementsofmathematics.com, click on the Operational Systems promotion link, and complete the enrollment process on or before December 1, 2015. EMF Course Pack 12: EMF Course Pack 12, which includes the first twelve EMF courses, is available at a 25% discount. To enroll in EMF Course Pack 12 for US$539.95 (regularly US$719.40 when purchased separately), visit www.elementsofmathematics.com, click on the EMF Course Pack 12 promotion link, and complete the enrollment process on or before December 1, 2015. IMACS is pleased to announce that the eleventh course of the Elements of Mathematics: Foundations (EMF) series, Algebra: Relations, Mappings and Equations over Fields, is now available online at www.elementsofmathematics.com. Algebra: Relations, Mappings and Equations over Fields continues the study of abstract algebra by introducing relations and their properties and examining mappings as special types of relations. Students then learn to solve linear, quadratic and rational equations with mappings by calling upon the powerful properties of relations. Students who complete the EMF algebra series will be able to solve any high school algebra problem with ease. But they will also have learned a great deal more and be well-prepared to study the high-level mathematics that is at the heart of important disciplines such as particle physics and cryptography. Operational Systems: Try the first EMF course (Operational Systems) at a 25% discount. To enroll in Operational Systems for US$44.95 (regularly US$59.95), visit www.elementsofmathematics.com, click on the Operational Systems promotion link, and complete the enrollment process on or before July 10, 2015. EMF Course Pack 11: EMF Course Pack 11, which includes the first eleven EMF courses, is available at a 25% discount. To enroll in EMF Course Pack 11 for US$494.95 (regularly US$659.45 when purchased separately), visit www.elementsofmathematics.com, click on the EMF Course Pack 11 promotion link, and complete the enrollment process on or before July 10, 2015. IMACS is pleased to announce that the tenth course of the Elements of Mathematics: Foundations (EMF) series, Algebra: Groups, Rings and Fields, is now available online at www.elementsofmathematics.com. Algebra: Groups, Rings and Fields focuses on the study of algebra, in particular the kind of algebra that is usually learned at university called "abstract algebra". Building on a solid understanding of operational systems, this course introduces groups, rings and fields and their mathematical properties. Students who complete the EMF algebra courses will be able to solve any high school algebra problem with ease. But they will also have learned a great deal more and be well-prepared to study the high-level mathematics that is at the heart of important disciplines such as particle physics and cryptography. IMACS is pleased to announce that the ninth course of the Elements of Mathematics: Foundations (EMF) series, Number Theory I, is now available online at www.elementsofmathematics.com. An exploration of numbers for their own fascinating sake is a joy that every young person should experience. This course provides that opportunity by investigating some of the most intriguing and timeless questions in Number Theory. Along the way, students learn about prime and composite numbers, prime factorization, and number bases as well as examining elegant ideas such as Euclid's Lemma, the Sieve of Eratosthenes, and the Fundamental Theorem of Arithmetic. Students expand their logical reasoning skills with an introduction to the powerful proof technique of mathematical induction. Interactive exercises help students practice their proof-writing skills with simpler conclusions, while animated narrations enhance rigorous yet accessible proofs of more significant results such as the multiplicativeness of Euler's totient function. IMACS is pleased to announce that the eighth course of the Elements of Mathematics: Foundations (EMF) series, Probability I, is now available online at www.elementsofmathematics.com. Probability I provides an introduction to elementary probability theory and covers one-stage, two-stage, and multistage random experiments, the Product Rule, counting subsets, combinatorics, and random digit generators. This is EMF's most technologically ambitious course yet with over half the pages containing an interactive device, narrated animation, or virtual classroom. Using these tools students learn about, replicate, or analyze the outcomes of a wide variety of random experiments online. The course concludes with an exploration of one of the most important methods in probability — Monte Carlo simulation — and two famous questions — the birthday problem and the Monty Hall puzzle. IMACS is pleased to announce that the seventh course of the Elements of Mathematics: Foundations (EMF) series, Decimals and an Application of the Rational Numbers (Decimals), is now available online at www.elementsofmathematics.com. Decimals builds upon knowledge of the rational numbers to introduce decimal numbers and their properties, arithmetic operations on decimals, and position notation for decimals. Students learn to compute various decimal approximations of rational numbers and to evaluate errors in approximation. The course revisits percentages in relation to decimals and arithmetic operations on percentages. Armed with a deeper understanding of decimals, decimal approximations, and percentages, students conclude the course with a case study of a fictional world in which mathematics is necessary to analyze a social and political issue. Summer is coming to a close, and so is the chance for teachers to get a FREE preview of the fully updated version of AP® Computer Science: Java Programming from IMACS. Contact IMACS to get immediate access. Each lab incorporates an innovative "Lab Checker" tool aimed at verifying that an Integrated Development Environment (IDE) is being used, and that the project in the IDE complies with lab instructions. Together, the eight labs far exceed the minimum requirements of the College Board to the benefit of APCS students taking the IMACS course. As always, IMACS offers teachers FREE summer access to our updated AP® Computer Science course during which you may preview our new labs in preparation for the 2014-2015 school year. Contact IMACS to register. IMACS has fully updated its APCS exam preparation online course as well. When it's time to study for the AP® exam, Be Prepared for the AP® Computer Science Exam, Interactive Edition will prepare your students thoroughly. Register for FREE excerpts. IMACS is pleased to announce that the sixth course of the Elements of Mathematics: Foundations (EMF) series, The Rational Numbers, is now available online at www.elementsofmathematics.com. The Rational Numbers builds on topics covered in previous courses in order to examine the rational numbers, commonly referred to as fractions, as a natural extension of the integers. The course uses detailed narrations and interactive number lines and coordinate planes to cover the absolute value function, the properties of operations on rational numbers, how they are ordered, and that they are densely packed, not evenly spaced as the integers are. Students learn how to solve equations of rational numbers through the foundational concept of mappings instead of with rote algebraic manipulation. Using interactive proof-builders, students also advance to the next step in learning how to construct well-reasoned and logical arguments. IMACS has added new labs to the updated version of its AP® Computer Science: Java Programming course that is being readied for the 2014-15 school year. We are making the curriculum available for a free preview immediately. All references to the GridWorld case study together with all the related teaching materials have been removed. Four fully-elaborated labs are in place. Placeholders and brief descriptions of four additional planned labs are provided. IMACS anticipates that the last of our four additional planned labs will be available for preview no later than May 31, 2014. Furthermore, we expect that, together, our eight labs will far exceed the minimum requirements of the College Board to the benefit of APCS students taking our course. Another outstanding resource for CS educators from IMACS: Be Prepared for the AP® Computer Science Exam, Interactive Edition. Get your students ready for the upcoming APCS exam. Click here to register for FREE excerpts. Broward County, Florida students currently attending grades 6-8 are invited to apply to the IMACS Math Academy, an intensive one-week program designed to stimulate talented students' interest in mathematics beyond the traditional classroom. There is no cost to attend the IMACS Math Academy! There are two scheduled sessions. The first will be held March 24 - 28 during Spring Break. The second will be held June 23 - June 27 during Summer Break. Both sessions of the IMACS Math Academy will be held at IMACS Headquarters in Plantation, Florida. Mappings examines relationships between the elements of two sets. Students explore various types of mappings, including permutations, with interactive ball sorters, slide rules and clever animations. Elementary combinatorial exercises lay the foundation for advanced concepts in Algebra, Geometry and Probability. Applying the properties of function composition, students delve into fractions and percentages in a mathematically rigorous and intuitive way. In early 2014, eIMACS will expand its online AP® Computer Science course with a new, advanced section on Android app development. Students currently enrolled in our APCS course may explore the beta version now! The new section introduces the app development process, from setting up the integrated development environment (IDE) to programming a game app to running it on a mobile Android device. Important aspects of the larger development process are also covered, including an understanding of key technical terminology, how various components of the project code fit together, and how to implement modifications and updates. The Android app tutorial is presented in a lab format, with students writing code online prior to integrating it into a project in their chosen IDE, and then following detailed guidelines to debug, modify, and improve the behavior of the resulting app. The section includes a number of online coding tasks and a single online test, all of which are autograded so students can get instant feedback. Parents and students may visit AP® Computer Science: Overview to learn more. Educators may visit apjava.eimacs.com for information on licensing the course. Ordered n-Tuples considers what happens when order is imposed upon a collection of objects. Building on concepts introduced in Operational Systems, interactive features such as taxi driver navigation and the rock-paper-scissors game give context to the properties of Cartesian product sets. An intuitive study of open sentences in two variables and the graphing of their solutions plant the seeds for future courses in Algebra. Students deepen their understanding of various mathematical operations as these concepts are extended componentwise to sets of ordered n-tuples. PLANTATION, FLA — This month the Institute for Mathematics and Computer Science (IMACS) – acclaimed for fostering lifelong problem-solving and critical thinking skills – celebrates 20 years of serving talented children as it expands its math program to Aventura, Florida. 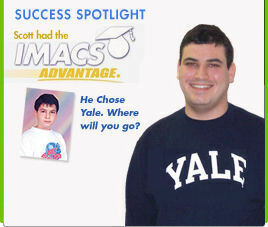 From humble beginnings of just 37 students in 1993, IMACS has grown to include 20 locations in four states and two distance learning programs. Together, IMACS programs serve more than 3,700 students across 10 countries. Whether at local IMACS classes or through its distance learning programs, eIMACS and Elements of Mathematics: Foundations (EMF), each IMACS student is challenged by ability level, not by age, using games, puzzles, dynamic technology and other engaging activities. Through these challenges, students develop logical reasoning skills far beyond their most advanced peers. 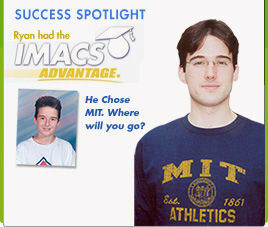 In fact, some students are taking college-level IMACS courses by the time they reach middle school. To IMACS President, Terry Kaufman, the institute's growth isn't surprising. "IMACS was founded 20 years ago on the idea that students' progress must be based on a genuine understanding of concepts, not on rote memorization," Kaufman said. "Many of our local families, as well as our distance learning students, are actively looking for supplements to an educational system that historically has emphasized standardized test performance over the development of critical thinking skills." "Former IMACS students tell me they're surprised to see the benefits of our elementary enrichment classes lasting five to ten years later when they are in high school," said Ted Sweet, IMACS Director of Curriculum Development. "Then in college and beyond, they realize the truth: the rigorous thinking skills they developed at IMACS have given them an advantage that will last their entire lives." In addition to operating classes at its Plantation headquarters, IMACS and its affiliates hold after-school and weekend classes at locations throughout South Florida, North Carolina, Missouri and Connecticut. Some locations also offer the IMACS Hi-Tech Summer Camp. For students who do not have local access to IMACS, select components of its highly acclaimed curriculum are available online at www.eimacs.com and www.elementsofmathematics.com. If you would like to find out more about IMACS classes or its eIMACS and EMF distance learning programs, contact them at 954-791-2333 or www.imacs.org. IMACS' Plantation headquarters is located at 7435 NW 4th Street. The Institute of Mathematics and Computer Science uses lively and innovative methods of teaching high level mathematics, computer science and logical reasoning skills to elementary and secondary school students. The new and improved IMACS Web site is now live at www.imacs.org! The site's modern theme and simplified navigation make finding information about our local area programs much easier. Users can learn about our highly acclaimed after-school, weekend, summer and homeschool programs and register for a free placement class at one of our local teaching centers. Visit www.imacs.org to learn more. IMACS is expanding to India through an exclusive license with MyPal Online School, an online education provider based in Hyderabad, India. MyPal now offers courses in Certified Java Programming and in Computer Science and Principles of Programming, both of which were developed by IMACS. Indian students who take these courses through MyPal receive the added value of local tutors, virtual classrooms and discussion forums which are a part of MyPal learning environment. MyPal offers bright students the opportunity to take university-level courses during high school, giving them a head start on higher education at a college or university. With MyPal online courses, students may earn credit at American universities through the Advance Placement (AP) exams of the College Board. Students save not only on tuition but also years spent in college. Indian students who are interested in taking Certified Java Programming or Computer Science and Principles of Programming through MyPal must first take the FREE Online Computer Science Aptitude Test (CSAT) developed by IMACS. Register for the test at www.eimacs.com/mypal. Sets, Subsets and Set Operations introduces the building blocks of set theory, which provides the basic language in which most mathematical texts are written. Learn about set properties and relationships involving sets with whimsical videos and the increasingly challenging String Game. Through mind-stretching, interactive exercises, students cover fundamental concepts such as elements, roster names, the empty set, subsets, Venn diagrams, intersection, union, set difference and complement, and the Pascal Formula. Visit www.elementsofmathematics.com for detailed information about EMF. The Integers introduces positive and negative integers with an unusual elevator and mysteriously disappearing nuts. Learn about adding, subtracting, multiplying and ordering integers by building interactive number lines and driving a balloon-popping car. Students are exposed to various theorems about integer relationships and carefully guided through the first steps of how to make a well-reasoned and logical argument in support thereof. University Computer Science II, the second course in the IMACS University Computer Science sequence, now includes an introduction to the Python computer programming language. Advanced concepts covered in this new section of UCS2 include object-oriented programming and artificial intelligence. Python is an interpreted high-level programming language known for clear and expressive syntax that lends itself to code readability. Python supports both object-oriented and imperative programming paradigms. Introductory computer science courses at top universities are frequently taught in Python. Click here for more information on the UCS sequence of courses, including detailed course outlines. IMACS is pleased to announce Elements of Mathematics: Foundations, a new series of online courses designed for bright secondary school students. EMF allows the talented student to complete all of middle and high school mathematics except calculus before leaving middle school. The curriculum is the result of more than a decade of research and development and has been in use with gifted students for over 20 years. Advances in technology now allow these courses to be offered online. The first course, Operational Systems, is FREE for students who enroll before January 1st, 2013. Our eIMACS brochure has a new look and updated content! Readers will find helpful explanations on what makes our curriculum unique, concise course descriptions, testimonials, and information on the application and enrollment process. 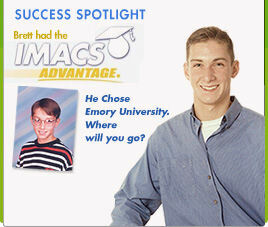 eIMACS provides talented middle and high school students with an opportunity to study university-level math and computer science online in an interactive and engaging way. Click here for more information on eIMACS online courses. University Computer Science II, the second course in the IMACS University Computer Science sequence, now includes an introduction to the Haskell computer programming language. Advanced concepts covered in this new section of UCS2 include infinite lists, list comprehensions, and tuples. Haskell is a purely functional computer programming language known for its expressive syntax and lazy evaluation. Functional programming languages are used in many substantial applications including expert systems, telecommunications, simulations, natural language understanding, and computer-assisted design. IMACS is now a sponsor of Girls Learning Code, an all-girls technology camp organized by Toronto-based Ladies Learning Code. One talented Girls Learning Code participant will receive a full-tuition IMACS scholarship to our 40-week online introductory programming course, University Computer Science I.
eIMACS students, especially those taking Advanced Placement Computer Science, may like to take a peek at a programming language that is very different from Java. Haskell is an "advanced purely functional" programming language. A "lazy evaluation" system means that primitive Haskell expressions evaluate to infinite data structures, something Java cannot do. Check out the free Facebook Haskell evaluator at www.facebook.com/HaskellMath.